Nintendo fans are celebrating Kirby's 20th anniversary this year, and Nintendo marked the occasion with the release of the excellent compilation, Kirby's Dream Collection: Special Edition, for the Wii. Just recently I was finally able to finish playing some Kirby games that I hadn't played before, and I was very curious to see how the Kirby games rank based on Negative World members' ratings. Yes, your ratings make the difference! Release dates shown are for U.S.
Click here for database entry! The world debut of the lovable Kirby! 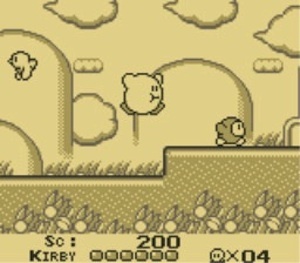 The designers had only seen Kirby on the Game Boy's black-and-white screen, so the box mistakenly featured a white-colored Kirby! Kirby did not have the ability to copy enemy abilities at this point. He relied heavily on inhaling and spitting enemies out, and of course his flying ability came in very handy. The first wave of 3DS owners received this game as part of the Ambassador series. 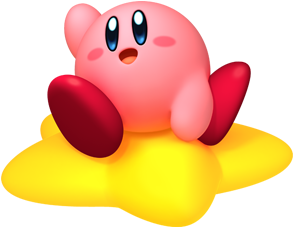 What sets this Kirby game apart from the others is the single, large world left to the player to explore. 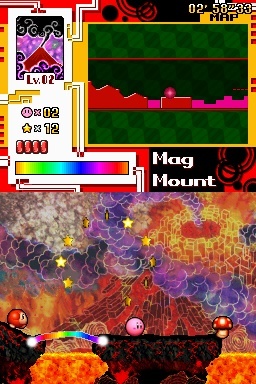 Kirby's different Copy Abilities are more critical to finish the game than some of the other entries. 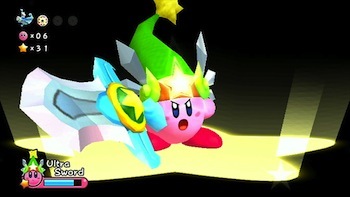 This entry featured some new Kirby abilities including Cupid, Missile, and Smash. A polygonal Kirby joins the party! Everything in the game, from the characters to the backgrounds are rendered in N64 polygons, and the game looks great, even when contrasted against the sprite-based Kirby games. Animation is smooth throughout the game. The game is still a 2D side-scroller, but the 3D graphics allowed for some fun, though limited uses, like walking a full circle around the Whispy Woods boss battle. This game is famous for allowing the player to mix Copy Abilities together (there are 28 different combinations!). 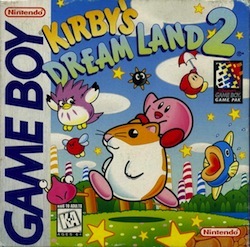 The Kirby series continued on the Game Boy (where he originated), with the second Dream Land game introducing Kirby's animal helpers for the first time: Rick the Hamster, Kine the Ocean Sunfish, and Coo the Owl. The fun part comes when you combine an animal helper with a Copy Ability. For example, Rick will chunk Kirby at enemies with the Cutter ability! This game turned out to be one of the 'killer apps' for the DS back in the handheld's early days. This touch screen adventure had you drawing lines for Kirby (who is simply a ball in this game) to roll along. He still gets to use his Copy Ability, but not by inhaling enemies. I loved how the stages were made to resemble different styles of paintings, such as oils and watercolors. 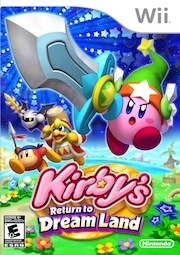 The most recent of Kirby's adventures, this game features even more new Kirby abilities like Water, Whip, Leaf, and Spear. 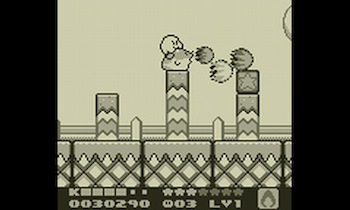 Four players can play simultaneously on the same screen, much like New Super Mario Bros. Wii. Good times are had by all! 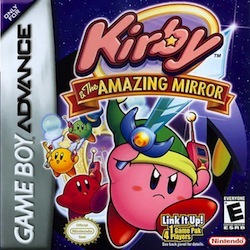 Another unique Kirby title on this list! 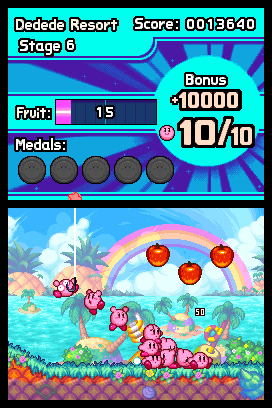 Using only the stylus, you control up to 10 Kirbys to bash enemies and overcome obstacles. No copy ability in this one, but that's ok. The Kirby charm is still in full force! 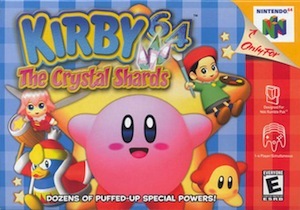 This game may not have starred Kirby at all! The game began development under the name "Keito no Fluff" (lit. "Fluff of Yarn"), featuring Prince Fluff as the main character. The game has striking visuals in that the world is created from realistic looking materials like fabrics, buttons, zippers, and brightly colored yarn. 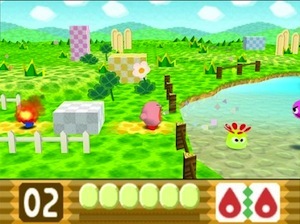 Kirby is actually pretty versatile in this game: he can transform, lasso things, and interact with fabric landscapes. 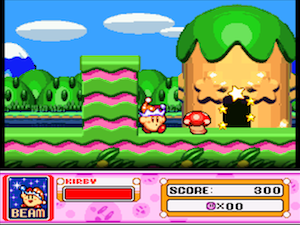 This is a remake of the NES game Kirby's Adventure. The NES game was rather impressive being a late-generation title, which was evident in some of the graphics like special visual effects, pseudo-3D backgrounds (including towers that appear to rotate in three dimensions) and parallax scrolling! Nice. Also, Kirby fights Meta Knight in a sword duel! 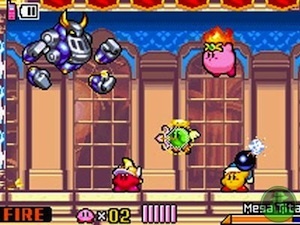 The GBA remake features updated graphics and sound (those backgrounds are very pretty), as well as some minor changes to the gameplay, new mini-games, and the ability to play as Meta Knight (in a mini-game called "Meta Knightmare"). 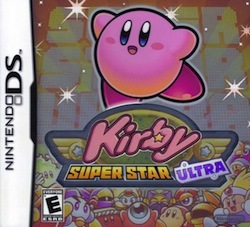 This is a remake of the SNES game Kirby Super Star and incorporated DS features like wireless play, touch screen play, and improved graphics. New game modes and minigames were also added. 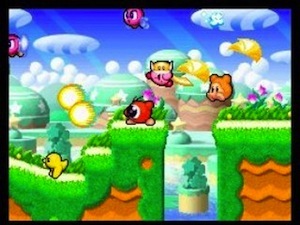 The SNES game is still considered by many Kirby enthusiasts as one of Kirby's best games ever, and rightly so! It's actually a collection of eight games in one (though some of the games are very short) and features a two player mode. 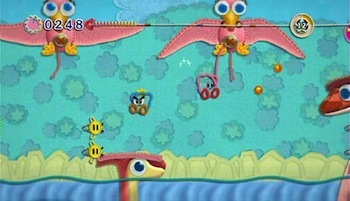 It was the first game in the series to feature different looks for different Copy Abilities. Kirby's Dream Land 3 didn't make the list unfortunately. Its score is 7.59 with 8 votes. 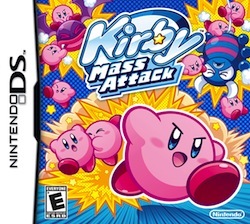 Kirby Squeak Squad (DS) didn't have a bad score (8.0), its problem is it just doesn't have that many votes (only 6). 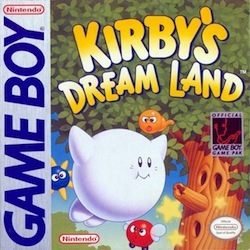 If I did include the spin-off games, this list would have had one game show up: Kirby's Dream Course, 14 votes, 9.06, tied with Super Star Ultra!! Where do your favorites stand on the list? I included links for each game so you can add your own rating if you have not done so already! In the end, the only thing that matters is that Kirby is a great Nintendo character, his games are packed with fun, and I look forward to seeing where he will end up taking us next. I started by trying to limit the list to only the Kirby titles that had 10 or more ratings, but I decided to take some liberty with game selection because of some of the remakes. For example, the list would have contained both Kirby Super Star (SNES) and Kirby Super Star Ultra (DS), but I decided to list the higher ranking one (DS) as representative of both games. In the end, the lowest number of votes for any of the games on my final list was 8. Also, my list contains what I categorize as the Kirby adventure games. 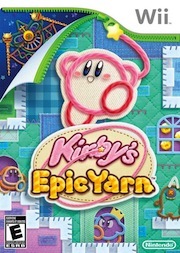 I suppose there could be some debate whether games like Epic Yarn or Canvas Curse qualify as adventure entries rather than spin-offs, but I believe they do. 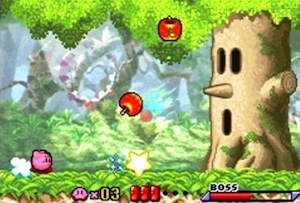 Kirby's adventure games can fall into either of two categories: (a) the inhale-exhale enemy ability copy type, and (b) the other type. Then there are the spin-off games which most will agree are not of the adventure type: Star Stacker, Dream Course, Block Ball, Pinball Land, etc. It turns out that the Kirby adventure games actually do rank higher anyway, compared to the Kirby spin-offs. I think Canvas Curse is my favorite. 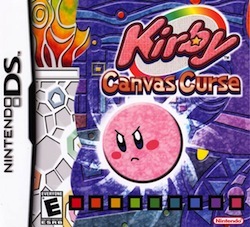 I tend to like the "alternative" Kirby games more than the mainstream ones. I have yet to play most of the Kirby games but I still love the pink wonder. Hopefully will be able to pick up the Wii and DS ones next year so I can play through them. We had Ultra, have no idea where it has gone though. I liked Super Star Ultra, but it was weird that you couldn't short-hop in the game. Every jump was full-height, even if you just tapped the button. I think I remember one or two other tiny changes from Super Star SNES bugging me, but overall it was a faithful port with nice additions. Dream Land 2 so low is a surprise, I thought that was generally considered #2. Shame Squeak Squad didn't get enough votes, I think it and Dream Land 3 definitely win out over the barebones original and Amazing Mirror's interconnected level design. 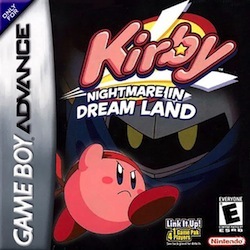 Nightmare in Dream Land is the only Kirby adventure I've never played. Was Meta Knightmare any good? Out of all the games on the Top Ten, the only one I haven't played is Super Star Ultra. Of course, I've played the SNES version multiple times; maybe I just never thought the updates in the DS version were enough to warrant a purchase? In any case, that's really weird that you can't short-hop! That sounds a bit... annoying. As for Meta Knightmare in Nightmare in Dream Land... I think this is the first time I heard about it when I was researching for this list! Sure enough, I didn't unlock it when I played the game. I just turned on my GBA cart; looks like I did 100% the normal mode, I started playing the Extra Mode (you only have three energy bars), but didn't finish playing it for some reason (you unlock Meta Knightmare by beating the Nightmares in Extra Mode). Looks like I'll be playing this game some more after all! Based on some youtube videos like this one, playing as Meta Knight is like having a permanent sword ability. I'm sure it will make certain aspects of the game more challenging. Oh man, thank all that is good that spin-offs weren't included. Dream Course is so, so....bad. Guh. That game puts the B.O. in BORING. Dream Course is so, so....bad. Puts Grant on the list. Again.